The FCC (Federal Communications Commission) today has certified the People's Cube as a state-approved source of "correct, truthful, authentic, forward-looking and genuine truth" that is safe to read, share, and discuss with neighbors, family, and co-workers. This confirms our leadership position among the progressive mainstream media, as our stories more often than not become reality. 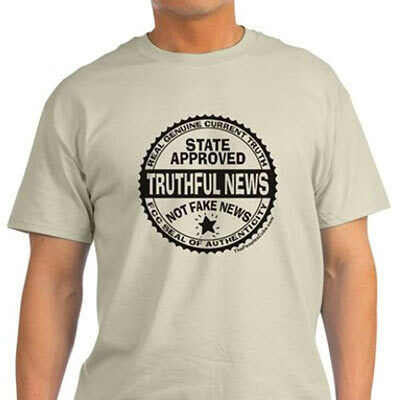 For bringing only the best current truth to the toiling masses of American workers, peasants, and the unwashed intelligentsia, the FCC has decorated us with the "Truthful News" seal of authenticity, which henceforth will be proudly displayed in our sidebar. While federal judges say that the deadline for such a recount has expired more than two centuries ago, many still believe that enemies of democracy may have used "fake news" to drag the country into the Revolutionary War and trick Americans into accepting capitalism and the electoral college. Some vocal senior activists have compared the current fake-news confusion to the debilitating panic among American food consumers who had no idea what to eat until in 1990 the FDA at last mandated the placement of Nutrition Facts Labels on all packaged products. In a similar example of caring oversight, the FCC has adopted a new certification system that separates all news into two clear categories: "fake news" and "truthful news." Additionally, a new law will require all media to display FCC labels to identify their classification. 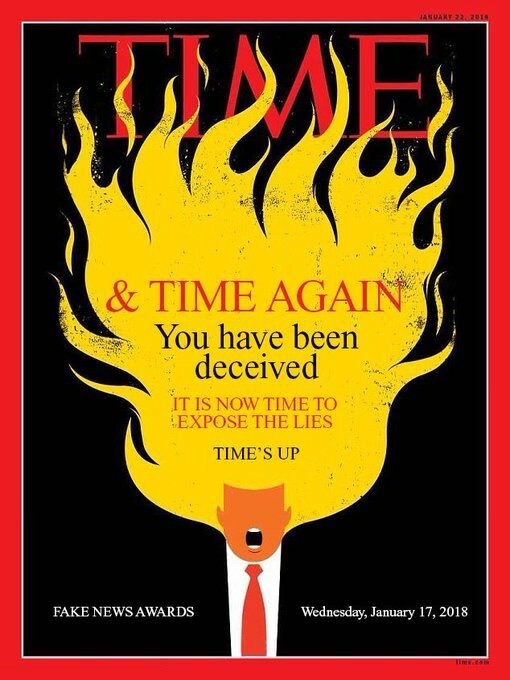 This will alert readers in advance whether they are looking at a genuine government-approved source of must-read truthful news, or they're reading some idiotic concoction of a madman with an unhealthy fixation on the so-called rights to life, liberty, and the pursuit of happiness. Obviously, anything based on such a false, backward premise qualifies as "fake news." Thus, Breitbart.com and similar alt-right media outlets that have been found guilty of misleading the American public into voting for Donald Trump, will be henceforth obligated to display the shameful "Fake News" seal of disapproval. It is only fitting that their false narrative of capitalism and American exceptionalism will be identified with a label similar to the Surgeon General's cancer warnings on cigarette packaging. This is yet another example of caring government oversight that proves critics wrong. Until all news sources have been properly certified and labeled with FCC badges, readers are advised to follow this helpful chart. In other news. Hillary Clinton has suggested to counter "fake news" with a government newspaper called "Truth" ("Pravda" for Russian speakers). Thank Lenin that Thepeoplescube has been approved for public consumption as officially NOT fake news. This was a forgone conclusion, but it "feels good" to get the official government Seal of Approval. Oh, how comforting it is to know that I will no longer have to determine on my own what is truthiness and what is fake. Thank Lenin for the FCC. And I really really love Dear Leader's word "truthiness." It is so ... cute! Comrade Red Square this shows sheer genius of the USSR in that they were way ahead of the times in directly labeling their news as Truth from the onset. I see no need whatsoever to read ANY other news channels than the peoplescube. It would be better if the new ICANN were to block all other news sites and send the traffic towards the Glorious Kube. No doubt you red commies will get the children involved in monitoring their parents reading habits. Nevertheless, it had a fair amount of influence among many Catholic families at the time. So how soon before we see a more secular version of it guiding the reading habits of the faithful in correct groupthink? On the bright side, many Catholics used the League's condemnation of a flick as an indication it was worth viewing. Funny how that works! There is a Stalin! I'm so happy that somebody out there is distinguishing правда from не правда for me. I used to have to figure it out on my own, and it made my head hurt. just a week ago, I transmit to my (Kraut) friends ‒ near all of them cases of Bacillus progressivus (cf. O tempora, o mores! footnote) ‒ a similar list, from a Certifiedly Truthful organ. Brainy guys they all are, the Bacillus ones flip me the bird and mutter darkly Trumpler, Trumpler. Sure, we remain friends (didn't I say, no birdbrains there?). ... I really really love Dear Leader's word "truthiness." It is so ... cute! May I respectfully ask: does, by any chance, 'Truthiness' come vrom zhe Dsherman 'Truthahn'? Truthahn being zhat yummy God of Thanksgiving Day ― all gobbledy-gobbledy-gobbledygook? Legitimate question... and didn't we note the number of "Life imitates The Kube" incidents recently goin' up exponentially? Soviet Orbit of yore : For sure the content of ‒ Polish variant here ‒ the indeks (as far as it was actually known to "the masses") or the fact of some text/book/movie being (claimed) na indeksie was for us simple proles an indicator, hah-hah. You learned about, say, a Solzhenicyn (i. e. his very existence, for starters) exactly that way. And sure as hell, the medieval Index librorum prohibitorum aka Index Expurgatorius had the same sideline function. This is most excellent news!!!!! Now I can use my 'offended couch' for other offenses. An FCC Label is the best way to tell the unwashed masses in flyover country that the gubmit loves them and knows whats best for them. Hopefully it won't be long before the unwashed masses will goosestep to the beet fields on command. That is, unless Pres. Elect-He Who Will Not Be Named doesn't muck everything up. just a week ago, I transmit to my (Kraut) friends ‒ near all of them cases ofBacillus progressivus(cf.O tempora, o mores!footnote) ‒ a similar list, from a Certifiedly Truthful organ.It is a Good Thing when one's organs are truthful. CNN says it's "illegal" to look at Wikileaks emails, but says the media is above the law. pardon, Comrade Director ‒ me a bit confused, here across the Big Pond ‒ is this (CNN) satire? A question on FB: I wonder, did Pravda and Izvestia warn the Soviet people to only listen to them, and not the myriad "fake news" sources? Me: That is exactly what they did. The main "fake news" sources at the time were on the short-wave radio - Voice of America, BBC, the German Wave (Deutsche Welle), etc. In the Russian slang it was called "Listening to the voices." And there was a large "basket of deplorables" who listened. BBC has changed so much since then that it might as well broadcast for the Soviet side if there was any left. Not sure about Deutsche Welle. Strange, but I can't comment. Don't listen to the radio. Also, have no opinion (lacking "data"). I guess this belongs in the Fake News category. And the great irony is that the only things the Russians could be faulted with (this time) are actually telling the truth and reporting the story our media is still trying to suppress. Indeed. For decades the Left loved Soviet disinformation and benefitted from it. The one time Russia told the truth, they scream #RussiaGate! The Cube has MORE COWBELL!!!!!!!!!!!!!!!!!!! All of their current opinion pieces seem critical of Trump, I didn't bother to read the articles since the headlines tell so much: http://www.dw.com/en/top-stories/opinion/s-101421 . Stephen Bowden over at American Thinker links to this story and uses our Guide to Fake News to illustrate his point. Fake news can be confusing. Or does it just depend on which way the 'cosmic winds' are blowing? This is so pathetically grotesque, an about-face of such molasses-thick idiocy. More grotesque is only the "think" that people (a few brain cells assumed) don't see through this contredanse. And since Snopes has already labeled us as a "clickbait site" on several of its pages, we may get a similar warning on our stories. On the other hand, if Snopes gets to be paid by FB for doing this, we may as well sue them for defamation unless they remove their defamatory language. LET THE KULTURKAMPF GAMES BEGIN ! P.S. This ‒ first trying (since ca. a year) to browbeat FB to install a kind of censure, and recently (yep, you got it..) "Fake News" hysteria ‒ goes on also here, zhe Dshermani. Smells verily like yet another "supranationally" behind-closed-doors coordination. • dying legacy MSM (trying to reinstall their "We have the News" "authority"). • NGO's full of experts of "Sumptin Studies" plus outright (college) dropouts, good-for-naught. • politicos (of any shade, Dark Red and Dark Green first) with bidirectional "paths" to those above, and complementary interests. P.S. This ‒ first trying (since ca. a year) to browbeat FB to install a kind of censure, and recently (yep, you got it..) "Fake News" hysteria ‒ goes on also here, zhe Dshermani. Smells verily like yet another "supranationally" behind-the-doors coordination. The biggest fake news story is the "fake news" story. It's akin to the recent glut of "alt-right" fake news stories. Everything is fake. Even me. Did you actually believe squirrels can type? ... Did you actually believe squirrels can type? hmm... some squirrels are more equal than others, ah? Aside from being involved in abduction of Democrat voters from battleground states, Vladya P now focuses on faking zhe Election-2017 in zhe Dshermani. Who knows, maybe - in fall 2017 - vee haff Herr Dummkopf as Bundeskanzler? ja? Did you actually believe squirrels can type? Let the smidgens do the typing. Are you trying to fake us out? I just don't know WHAT to believe anymore. Komrades, we need to spiffy up the place and dust off the coffee mugs & tees, FAKE NEWS is on the trend.